Yesterday's burst of warm weather triggered this craving for the classic summer combination of heirloom tomatoes, mozzarella and fresh basil. A huge fan of anything mini (Baked by Melissa, cake pops, mac and cheese cups, you name it), this Tomato and Bocconcini Mozzarella Salad uses grape tomatoes and mozzarella balls as a fun miniature take on the traditional pairing. In fact, bocconcini means "small mouthfuls" in Italian! Tossed simply with a good olive oil and balsamic vinegar and a generous sprinkle of salt and pepper, this salad wins across all audiences from the pickiest eater to the true gourmand. Multicolored heirloom grape tomatoes spruce up the salad visually and add a slight variety in taste. Bocconcini mozzarella can be found at any specialty cheese shop plus Whole Foods or Trader Joes, but if you have trouble locating it, another aesthetically pleasing presentation would be to stack thinly sliced rounds of regular mozzarella and tomatoes. If you can find both yellow and red tomatoes, alternate them between layers of cheese and fresh basil, and finish by drizzling the olive oil and balsamic on top of the stack and around the plate. 1. 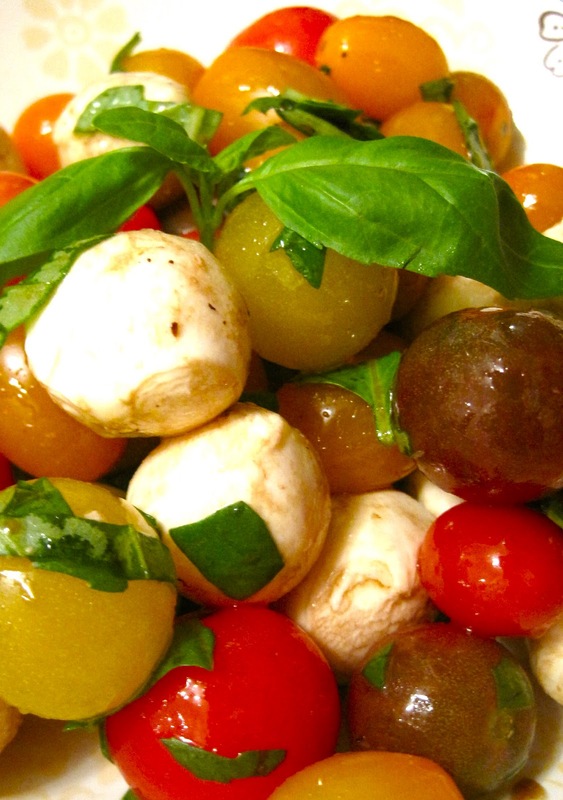 Toss together grape tomatoes, fresh mozzarella, olive oil and balsamic vinegar.